The oval carapace of the Malaysian painted river terrapin is somewhat flattened, and the scutes roughened with growth annuli. Juveniles have a well-developed continuous medial keel and an interrupted lateral keel on the pleural scutes of each side. These keels disappear with age. The adult carapace is light brown to olive with three broad, black longitudinal stripes. The plastron is well developed, but smaller than the shell opening, and has only a shallow posterior notch. The bridge is broad and the plastron extensively sutured to the carapace. The plastron and bridge are uniformly yellow or cream colored. The head is small to moderate in size with an upturned, pointed, projecting snout, and a shallow medial notch on the upper jaw. The back of the head is covered with small scales. The limbs have enlarged transverse scales. There are five claws on the forefeet, and all toes are heavily webbed. The limbs and other soft parts are normally olive to gray. The head of the female is olive, and that of nonbreeding males charcoal gray. During the mating season the male's head becomes white and a red stripe develops between the eyes. Males are shorter than females and have longer, thicker tails. The range of Malaysian painted river terrapins is southern Thailand through Malaysia to Sumatra and Borneo. Malaysian painted river terrapins inhabit estuaries and tidal reaches of medium to large rivers. Malaysian painted river terrapins are nocturnal. They are browsers or grazers, and follow a zigzag course while feeding. They take only a few leaves from each plant, ensuring food for future feeding. They are good climbers, can jump by rising onto their hind legs and leaping up, and can squeeze between narrow gaps comfortably. Tapirs are solitary, unsocial, cautious creatures. They avoid open territory, and prefer to stay near water. They will stay close to one locality and use regular paths, walking with the nose close to the ground to pick up scents. They transmit signals with their ears and mouth, and have good hearing. They are excellent swimmers and divers. If alarmed, they will stay submerged in water for several minutes. They walk on the bottom of streams like the hippo, and will protect their body surface against insect bites by rolling in the mud for a protective film on the skin. They usually defecate in water. In the wild, one to three will live together. Their predators are large cats (tigers, leopards), crocodiles, and man. 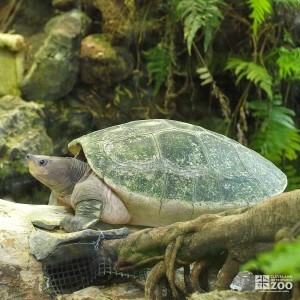 Breeding for the Malaysian painted river terrapin occurs throughout the year. They can produce every 18 months. When in heat the female may pursue the male. Mating takes place on land or in the water. The young have horizontal stripes and dots on their coats. The white part begins to show after about 68 days. After this the light coloration becomes more and more pronounced, while the stripes fade out, disappearing at about 155 days. Sexual maturity is attained at 3 to 4 years.